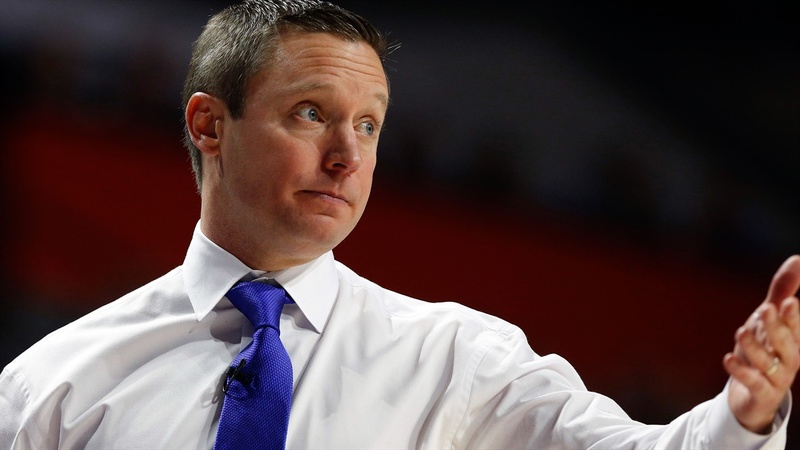 The Florida Gators (11-8) couldn't find a way to come up with their third win in a row, losing to the TCU Horned Frogs (15-4) 55-50 in Fort Worth, Texas on Saturday. Florida was unable to crawl all the way out of the double-digit hole it created in the first half, never leading in Saturday's contest. WHAT WENT WRONG: A lot. A lot went wrong for the Gators, especially in the first half. Florida tied its lowest point total for a half this season, going into the break behind 32-20. Florida only shot 28 percent in the first half, getting outrebounded by the Horned Frogs 24-17. Noah Locke and KeVaughn Allen had abysmal first-half performances, and that added to the stagnant offense the Gators were displaying. In the second half, Florida did well to get back into it and tie the game, but at no point could they get over the hump and take the lead. Senior guard Jalen Hudson couldn't do anything right in the second half, pressing and forcing unnecessary shots in inopportune moments for UF. Hudson went 2-10 from the field overall, going scoreless in the second half. The truly eye-opening stat was on the boards. TCU outrebounded Florida 45-33 for the game. WHO STOLE THE SHOW: For TCU, two players stood out the most on Saturday. Forward Kouat Noi scored a game-high 22 points for the Horned Frogs, grabbing six rebounds and hitting three triples from long range. Guard Desmond Bane added 17 points, six rebounds and three assists himself. For the Gators, only KeVaughn Allen scored in double digits (11 points). NUMBERS DON'T LIE: The Gators didn't shoot well, and that's evident by both the stat box and scoreboard. UF made 31 percent (19-62) from the field and just 30 percent from three (8-27). The team wasn't aggressive enough attacking the basket either. Florida went 4 of 5 from the free-throw line compared to TCU's 14 of 19. BOTTOM LINE: UF is missing a few important bodies down low, and that's going to continue to hurt them moving forward. TCU's size made the Gators uncomfortable, forcing quick shots, and outrebounding Florida by double digits. Mismatches on the court were evident at times during the game, and Mike White is going to have to hope Dontay Bassett and Kevarrius Hayes can stay out of foul trouble in future games. UP NEXT: The Gators will be back home in the Exactech Arena on Wednesday night when the Ole Miss Rebels (14-5, 4-2 SEC) come to Gainesville. Mike White's alma mater is currently ranked 20th in the nation behind new head coach Kermit Davis. Last season, Florida lost its only meeting with Ole Miss 78-72 in Oxford, Mississippi. With the loss to TCU today, and the tough schedule coming up, this game is huge for the Gators, especially on their own court.